ProStrainer™ AB - Proflo, Inc. 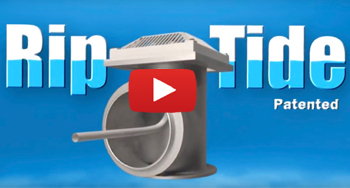 These automatic electric strainers combine the advantages of high quality filtration from different water sources (sewage, reservoirs, rivers, lakes, etc.) with a self-cleaning feature, offering the customer a continuous water supply. The strainers are designed for use in a wide range of industrial, municipal and irrigation applications. The inner element is made of stainless steel in order to withstand high dirt load and pressure. Cleaning of the screen is performed once the pressure loss across the filter has reached the pre-set value [up to 0.5 bar (7 psi)]. The flushing valve opens and pressure in the flushing chamber and the dirt collector is significantly lowered resulting in a suction process via the suction nozzles to the dirt collector and from there through the flushing valve outside. The electric motor simultaneously rotates the dirt collector and moves it along its axis. The combination of the vertical movement and rotation guarantees that the suction nozzles will cover the entire internal screen surface, efficiently cleaning the screen. The whole process takes 8-10 seconds, and the water supply is uninterrupted. The strainers are electro statically coated with polyester or epoxy powder at a thickness of 150-200 micron and oven cured. A time basis backup (preset by the operator) guarantees that flushing cycle will occur even if the head loss has not reached the pre-set value. Screen: 316 Wedgewire or Perf. Water enters the strainer through the “Inlet” (1) and passes through the fine screen (2), which purifies the flow by separating the smaller particles from the water. As more water flows through, impurities build up on the fine screen. As impurities on the screen accumulate, a pressure imbalance is built up between the internal section of the fine screen (2) and its external section. When the difference in pressure reaches the preset value on the differential pressure indicator, or the duel time between flushing passed, a series of events is triggered while water continues to flow to the system units. The controller transmits a signal for a 10 second flushing cycle. The flushing valve (4) opens, pres- sure is released from the inner side of the fine screen (2), the electric motor (5) simultaneously rotates the brushes (3) around its axis. The brushes wipe all of the dirt and effiicently clean the entire internal screen (3) surface. At the end of the 10 second cycle, the flushing valve (4) closes and the operation of the electric motor (5) is stopped. The filter is now ready for the next cycle, with clean filtered water flowing through the “Outlet” (6). The 10 second flushing cycle resumes operation whenever the difference in pressure reaches the preset pressure value set on the differential pressure indicator. If the pressure difference remains unchanged after one cycle, another cycle will start after a delay of 10 seconds.